I was interviewed by Kerry Lutz on the Financial Survival Radio Network, August 8th, 2011 about mid $1700 gold, the US credit rating downgrade, the decline of the West and whose fault is it? Video Online Only ~ not available on newsfeed, CLICK TITLE. Why Does the Price of Gold Go Up? Because there is so much volatility in the market place today and signs show we are in an inflationary period, the rules above no longer seem to really apply and the gold market has now taken on a life of its own. There are other things that affect the price of Gold like knee-jerk reaction buying and selling based on fear and greed. Collapsing currencies, countries going bankrupt, rumors of war and war, etc. have always affected the price of Gold. People flock to gold as a safe haven during these times. Of course, there is also the long-term manipulation of the price of gold. The spot price of gold and silver have been manipulated and suppressed for many decades by the central banks, governments and JP Morgan. This was something that was dismissed as conspiracy theory bunk only a year ago and now that the Andrew McGuire story broke through to the international main stream media, thanks to Bill Murphy of GATA, it is being accepted more and more as fact throughout the world. – Federal Reserve and other central banks printing money (out of control) causing inflation. 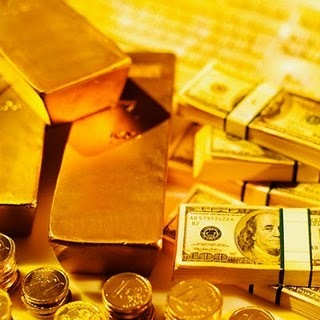 – Gold for millennia has been a safe storage of value – Historically, all civilizations and cultures go back to gold after they debase their currencies. Washington is allowing the Federal Reserve to print money into existence and there are no signs on the horizon that this will end or slow down. – If you look at any historical gold chart, gold has risen with small corrections and pull-backs along the way and in the big picture, steadily climbed. This is a classic sign that gold has been chronically bullish with no bubble in sight. – Basic Supply and Demand Fundamentals: There is less than 1/2 an ounce of gold above the ground per person alive on the planet right now. What does that mean when failing currencies prompt everyone at once to turn to something more sound? – Jim Rogers was quoted that he is not selling any of his gold. If gold goes down, he’ll buy more. If it goes up, he’ll still get more. He is certain that due to the imbalances in the world economy and financial system right now, we are heading towards a currency crisis in the next year. Does this sound like the actions of someone who has heavily invested in a commodity that is in a bubble status? – China has already said that their demand for gold will double in the next 10 years. Is this bubble talk? – Looming currency crises globally – You cannot open a newspaper or turn on your TV today without being told about the declining Euro and other failing currencies. This will become more prevalent in the media in the coming months. Finally, because we know gold is inflation-proof, we know that the price of gold isn’t actually going up or increasing in value, it is the value of the dollar that is decreasing. An ounce of gold purchases the same today as what it did 2000 years ago. It is the purchasing power of the dollar that is decreasing. As Simon Heapes said “You cannot study the subject of Gold and Silver without studying its counterfeit, that being the world’s paper currencies.” Simon also recently reminded us that “Taking time to study history gives you the “jump on the crowd.” History repeats. Consider King Solomon who said, “There is nothing new under the sun, that that is, is that that will be again.” This is particularly true with markets and the emotional reactions of the crowd”. In history, we have learned that in times of economic hardship and despair, there is also great opportunity. Ask me how you can participate and position yourself for the “Great Wealth Transfer”, which will accompany the looming financial crash.